An artist’s impression of a hyperloop system by Hyperloop Transportation Technologies. The world’s first commercial hyperloop system, which is set to open in Abu Dhabi in 2020, will cost between $20 million and $40 million per kilometre, said Bibop Gresta, chairman of Hyperloop Transportation Technologies. In an exclusive interview with the Emirates News Agency Wam, Gresta announced that Abu Dhabi’s Hyperloop capsule has left the assembly facility in Spain for Toulouse, France, where it will be tested and optimised, adding that this first-of-its kind project in the world “can recoup the investment in eight to 15 years”. In April 2018, HyperloopTT signed a memorandum of understanding with Abu Dhabi’s Aldar Properties, which, when executed, will allow for the creation of a new Hyperloop TT centre including a full-scale commercial Hyperloop system, an Hyperloop R&D Advanced Mobility Centre, a Demonstration & Visitor Centre, and an Innovation Hub. “The capsule has already left the assembly facility in Spain, and is on its way to Toulouse, France, where we have a prototype track. As soon as it arrives in Toulouse, it will be put in a tube and then they will test the system with the first passenger,” Gresta added. 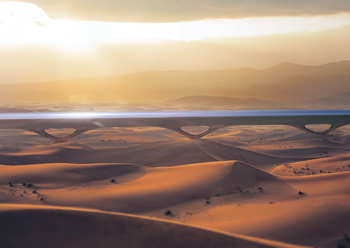 The cutting-edge technology uses electro-magnetic levitation engineering to carry pods at 1,123 km/h, reducing travel times between the emirates from hours to minutes. “The Hyperloop system would have a low cost of implementation, as compared to other high-speed transportation methods. It is a simpler, lighter-weight, and less energy-intensive system,” he added.